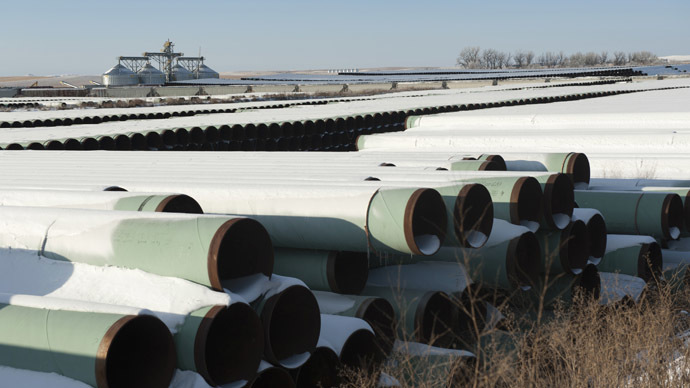 The Environmental Protection Agency said that despite the State Department’s evaluation of the Keystone XL oil pipeline, it does present a “risk of spills,” pollution, and could contribute to global warming. Specifically, the EPA sent a letter to the State Department acknowledging the important commitment that the company behind the pipeline, TransCanada, made to being “responsible for clean-up and restoration of groundwater as well as surface water” in the event of a spill. However, the agency said it is concerned over the State Department’s conclusion that the pipeline does pose an oil spill risk. The EPA added that the development of Canada’s oil sands “represents a significant increase in greenhouse gas emissions.” Falling oil prices could also “result in increased oil sands production,” leading to more air pollution, the department said. Notably, the EPA said the State Department’s Final Supplemental Environmental Impact Statement (SEIS) makes clear that oil sands crude has a higher lifecycle of greenhouse gas emissions than other crudes. “Lifecycle greenhouse gas emissions from development and use of oil sands crude is about 17% greater than emissions from average crude oil refined in the United States,” wrote Cynthia Giles, assistant administrator for Enforcement and Compliance Assurance. Notably, the EPA was critical of the pipeline’s construction for financial reasons as well. The Final SEIS found that with the price of oil dropping as much as it has – it’s currently selling at around $51 a barrel – the argument that shipping oil by pipeline is more cost-effective than shipping by rail needs to be reevaluated. “Given recent large declines in oil prices and the uncertainty of oil price projections, the additional low price scenario included in the Final SEIS should be given additional weight during decision making, due to the potential implications of lower oil prices on project impacts, especially greenhouse gas emissions,” wrote Giles. Monday was the final day for federal agencies to submit their comments on the Final SEIS. The administration is expected to review those comments and issue a decision on the pipeline in the coming weeks.